Community-based monitoring (CBM) is a type of scientific data collection that is led and driven by citizens or non-governmental organizations and seeks to increase direct community involvement in research and monitoring program design. Prepared for Living Lakes Canada and The Gordon Foundation, this report considers three core challenges for CBM: (1) ensuring CBM data are credible, (2) ensuring CBM data effectively inform decision-makers, and (3) ensuring CBM data are accessible and aggregated across watersheds and regions. 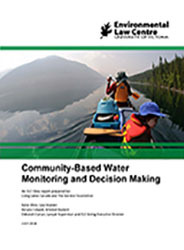 Given the mutual benefits afforded by CBM to communities and governments, this report is intended to identify successful approaches to address these challenges when incorporating CBM water quality data into Canada’s water monitoring framework.